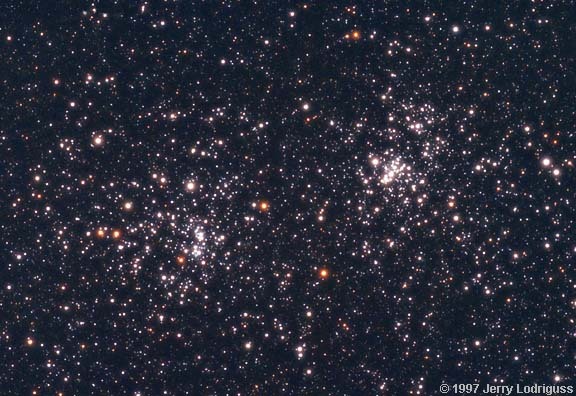 These stars can be seen late evening in mid-late fall. After midnight, the winter stars start coming around again.. The Fall sky does not contain many bright stars, but there are still stories to be told and things to see. Off to the West, the Summer Triangle (Vega, Deneb, and Altair) is starting to set. Over in the East, we see Orion, Aldebaran, and Capella starting to rise. Queen Cassiopeia was a very boastful queen, wife of King Cepheus, who often claimed the she and her daughter Andromeda were the most beautiful in the land, even more beautiful than the sea nymphs. This angered Poseidon, who sent the sea monster Cetus to destroy Cepheus's kingdom. An oracle told Cepheus and Cassiopeia the only way to save the kingdom was to sacrifice Andromeda. So Andromeda was chained to the rocks to await Cetus. But along came the hero Perseus riding on the winged horse Pegasus, Perseus used the head of a medusa to turn Cetus into stone, then slayed the monster and freed Andromeda (and then married her, of course!). Poseidon, still mad at Cassiopeia, threw her into the sky, where she spends half her time sitting upside down. 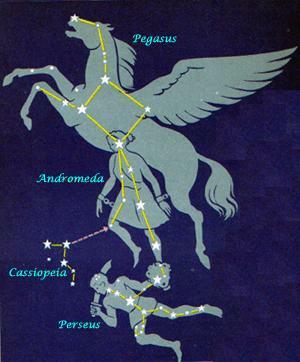 The main body of Pegasus the Horse can be seen as the four moderately bright stars that make a square in the Fall night sky. The nearest big galaxy to us. 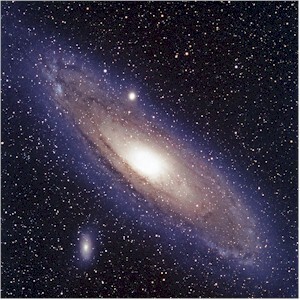 It's a spiral galaxy like our Milky Way, holding hundreds of millions of stars, but about 2 million light years away. It can be seen as a faint smudge of light with binoculars if you have a dark sky and know where to look. Sadly, Fall 2017 isn't a great time to find planets. You'll catch Saturn in the southwest just after sunset, and Venus and Mars low in the east just before sunrise. But there really are no bright planets visible during the night. But remember, since the planets change position in the sky as they move on their orbits, in future years the fall skies will show planets again!